The brightest, smoothest coverage available in an underwater strobe. In a real world, side-by-side comparison, the DS160 remains one of the brightest strobes on the market. More importantly, the quality of light is exceptional due to a round flash tube and custom powder coated reflector designed specifically to deliver the softest, most even coverage possible. The DS160 remains the favorite of pros worldwide for delivering a warm light without needing to add a light-dimming diffuser. The size of the DS160 is uniquely balanced to its weight to provide neutral buoyancy in salt water, resulting in superb handling without the need for expensive and clunky buoyancy arms. Need a video light too? Check out the DS161 Substrobe. TTL flash exposure. Accept no substitute. When combined with a compatible Ikelite TTL system or film TTL system, the DS160 automatically adjusts brightness to provide perfect exposure whether you're shooting macro, portrait or wide angle. Neutral buoyancy in salt water. The DS160 is approximately neutral in salt water for the most ergonomic and comfortable handling of your camera system. Other strobes require expensive buoyancy arms to provide this key feature! 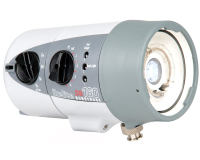 Like every Ikelite product, the DS160 Substrobe is designed, built and tested in the USA. We use locally sourced, top-grade materials from trusted vendors we've been working with for decades. Our housings are built by hand and individually tested for fit, function and waterproof integrity. The average assembly technician is a certified scuba diver and has over 16 years of experience building Ikelite products. We back our products with over 50 years of experience and service within the dive industry.